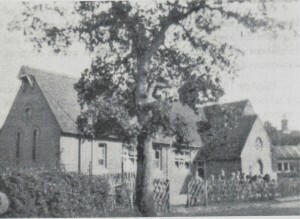 Winchet Hill School was built and paid for by the Church Authorities as a result of the 1870 Education Act. Situated between two and three miles from Goudhurst at Curtisden Green it opened in 1872 and took pupils from the parishes of Goudhurst, Staplehurst and Marden. Living accommodation for the teacher was built in 1875 – the Canterbury Diocesan Board of Education paid £30 towards the building costs.The school was Church of England (controlled), which meant that the Church Authorities were entitled to appoint some of the managers but did not have to make a financial contribution and Church doctrine was taught at the discretion of the head teacher. Initially the school taught children from the age of four until they left in the term after their fourteenth birthday. Christmas and Easter holidays were of about two weeks, but the school closed from the middle of June for three weeks for the fruit-picking season, and from the last week in August to the end of September for hop-picking. These holiday “breaks” were in recognition of the fact that the children would be absent from school regardless during these times as the money they earned fruit and hop-picking was a necessary addition to the family finances. The brightest children were able to go to a grammar school if they could pass the scholarship at eleven years old and if their parents were able to afford the necessary school uniform, transport and books. Many parents could not afford for their children to so. In 1937 there were 37 children on the school roll – the school had room for between 80 and 90 pupils. Evacuees from Woodhill School Woolwich in London arrived in Curtisden Green in September 1939 . To begin with they were taught separately from the local children as this was in keeping with a national directive which stated that evacuees and “native children” should have separate schooling and registers. In practice this proved impractical and by January 1940, ten of the evacuees had joined classes with the local pupils at the school. The rest continued to be taught independently by a Woodhill teacher based at Bethany House School. In 1944 the Education Act raised the school leaving age to fifteen and the school roll was subsequently increased by one tenth. After the war the senior boys of Goudhurst parish schools including Winchet Hill, attended Swattenden County Secondary School whilst the senior girls went to Highgate School in Hawkhurst and later to the new Mary Sheafe school in Cranbrook (later called Angley School). The more able children attended grammar schools in Tonbridge and Tunbridge Wells. When the senior pupils moved to secondary schools in 1949/1950 all that remained at Winchet Hill were 27 children, the Head teacher and one assistant teacher. The Headmistress at that time was Miss Alice Lilian Margrett whose family had come to live in the School House at Curtisden Green in 1919, when her mother, Sarah, was appointed headmistress. Sarah Margrett retired as headmistress in 1934 (died 1937) and Alice, who had been teaching at the school since about 1920, took on the role. She retired in April 1954 and died in 1980 at the age of 90. During the following years like many village primary schools Winchet Hill experienced falling rolls. From a peak of 83 pupils in June 1967 by the time it closed, after 112 years of teaching, in July 1984 there were only 13 children attending the school.